Curling Stones for Lego People: New Year's Bead Resolutions - are we nearly there yet? New Year's Bead Resolutions - are we nearly there yet? For the last 3 Januarys I've set myself some New Year's Bead Resolutions for the year, as a way of focusing my bead collecting and to some extent how much I spend on shiny things! As 2013 & 2014 were rather successful in shaping my bead collection, I only set 2 resolutions in 2015 as a result - overall I was quite happy with how things were going. I've achieved so much from this resolution, without actually booking a lesson... What I did instead was book a taster session and as a result of this I'm on a voyage of self discovery in glass. Glass Rods - waiting to be turned into beads! Since that session I've been booking workshop time (literally renting a bench) and experimenting with glass. I now own a "rejects" jar, a rod of "love them but can't core them" beads as well as a couple of rods of cored beads. As each session comes along, if I take my time, there are less beads going in the rejects jar and more that I can, and am wearing myself. 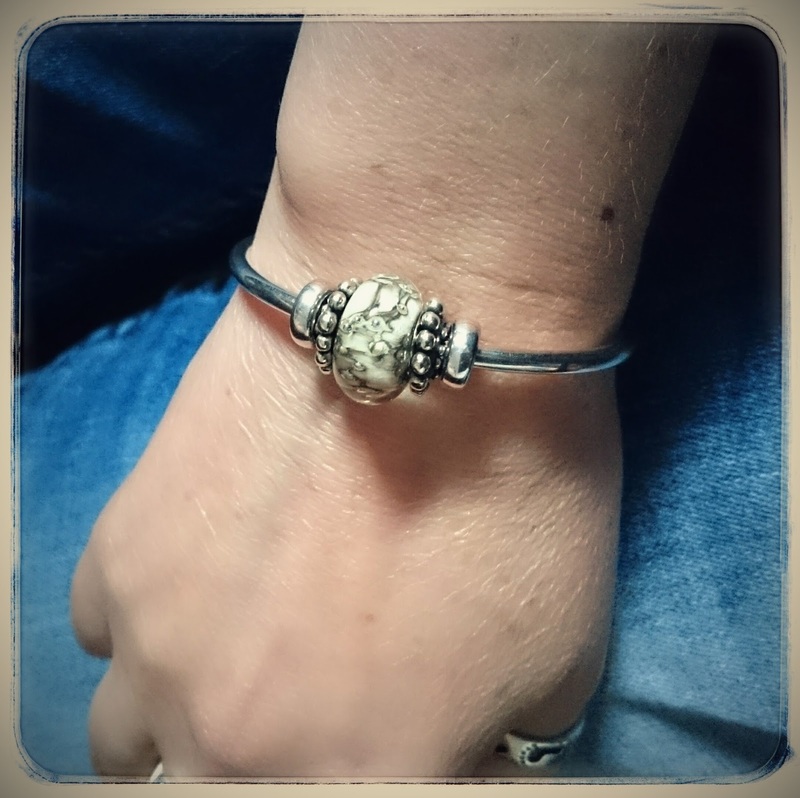 Trollbeads Bangle & Silver Beads with Glass Bead by Me! I'm really enjoying working with glass, it's a fascinating material to work with, I think of it as art meets chemistry and I absolutely love it! I surprised myself when I looked at the figures for the first six months, especially as I stumbled upon my dream wish list silvers last month, took the plunge and bought the whole set in one go! I'm on track with resolution No.2 despite these lovelies!! But it's true, adding it all up I've actually spent less so far than I had by this point in 2014, I'm sure this has been helped tremendously by the money that I've spent on my bus rather than jewellery, but the fact remains I'm well on track with this one too! Did you make any promises to yourself this year? What has caught your imagination (or your pocket) so far this year? Good for you for doing so well on your resolutions so far! Having watched bead demonstrations, I am in awe of anyone who can manipulate glass into beads. And from the teasers that you've posted, you are doing a great job! I'm curious, why can't you core the rod of "love them but can't core them" beads? Is it that the hole is too small that if you cored it, it wouldn't fit TB? Can you still wear them uncored? And that Chinese Silvers set is so worth breaking a budget for (and even better that it didn't break your resolution!) I have a few on my wishlist, but they never come up when I have the cash. My "love them but can't core them" is where the edges to the hole are too uneven to take the core... predominately where I've been experimenting with patterns but have lost, or never had a decent edge. Yep no regrets on the silvers (still pinching myself that I've actually got these, never thought I'd have the opportunity at a sensible price) or my other splurges this last month, a bit like those carved ambers, it's a case of grin and bear the short term pain financially for many happy years of contented bead wearing! Shall look out for yours, still shocked I came good on no.2!! Oooh love your bead! My bead addiction is currently on hold. Have been saving for other purchases. For instance I just got a nice new propane grill for hubby for our wedding anniversary. Also, saving up for building a deck for our home. We'll have to see what the guy quotes us. Argh I've just lost 2 comments to you just now due to being cack handed with my typing this evening! My rejects jar is a window sill decoration at the moment, as I have them in a see through glass jar where the light catches them, but no flowers yet, that's a great idea! Sorry you had to retype your response so many times. Just one of those days sometimes. hehe. How fab! I love Ohm beads, I don't actually have many, but I can't help loving everything they do even if the bead is not something I'd wear myself... such a brilliant design team and I love the way they are on social media too. I think Ohm are going to be the brand that cracks my "don't like branding on glass cores" rule. They keep coming out with glass that I like, and I'm warming to the whole branding on cores, well if it's Ohm I seem to be thawing out a little bit! I got retired beads since they were 50% off. Jungle, Fern Gully, Chinese Letter "Love", Heart Rings, Folk Hearts and Hugs and Kisses. Not exactly the quirky items Ohm is known for, but the more signature Ohm items I want aren't on sale, so I'll have to wait. So which Ohm glass beads have caught your eye? I really like their barrel glass transparent colours and the cracked glass beads in particular, but the recent Smoke on the Water caught my eye as well! Must be a good feeling to wear your own bead! You did a great job, it looks beautiful! Omg Birds and Flowers for 29 Euros!!!!!!!!!!!!!!!!!!!!! That's a beautiful bead at an amazing price. Not surprised you were squeaking out loud! I did that when I was able to buy a TB carved amber bead that was the Roses one, unfortunately I was at a work conference when I found out... had to run to the toilets to do a "happy dance" in almost privacy... think the other delegates thought I was quite crazy. I'd always promised myself that if I had the opportunity to buy this set I would, and I'd worry about the budget at my leisure, I've only got one before, so now I have two Dragons, and one of everything else, but I absolutely adore this set above all other silver sets, yes even my beloved Zodiac Stars... I wish we could have more of these kind of beads. Thanks for the compliment about my bead, it is a great feeling to wear your own, I was really proud of this one and it's getting a LOT of wear, but I do love TB Lotus Tops as bead caps and one was bought for me by a lovely Trollfriend from France so it's extra special! 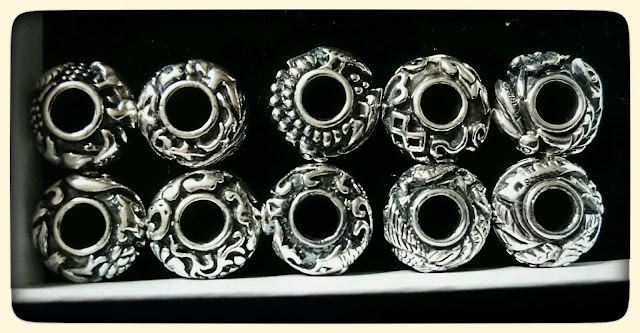 So pleased you got your Chinese silvers - they are a stunning set, real works of art. Thanks Amanda, I'm so pleased too!